Feel free to read the brief in full, but here are excerpts that highlight why the U.S. Supreme Court should allow the redistricting process to move forward and deny the request to stay the lower court’s decision. In the oral argument in Gill v. Whitford, Justice Kennedy raised the hypothetical of a state law that “says all districts shall be designed as closely as possible to conform with traditional principles, but the overriding concern is to increase [seats] for party X.” Oral Argument Tr. at 19, Gill v. Whitford, No. 16-1161 (U.S. Oct. 3, 2017). Counsel for the legislative amici (who also represents the Appellants here) agreed that such overt partisan discrimination would be unconstitutional. “[T]hat could be your instance of a problem that can be actually solved by the Constitution.” Id. at 26. Justice Kennedy’s hypothetical is this case. 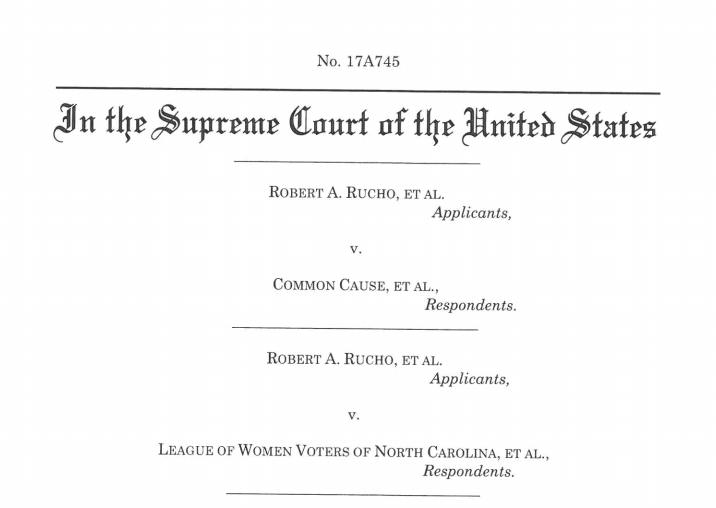 Third, Appellants’ motion should be denied because, if remedial proceedings are stayed, North Carolina’s voters will likely be condemned to a fourth consecutive election under an unconstitutional congressional map. In 2012 and 2014, the districts eventually invalidated on racial gerrymandering grounds in Cooper v. Harris, 137 S. Ct. 1455 (2017), were used. In 2016, North Carolina’s voters went to the polls in an election in which, thanks to partisan gerrymandering, their preferences were not reflected in the makeup of their congressional delegation. And in 2018, this injury will be inflicted anew if a stay is granted. Moreover, in that event, the merits briefing should be expedited so as to allow a decision this Spring, in time for a new plan to be used in the 2018 election. A single election under an unconstitutional map is one too many; four are intolerable.